The pictures to the right show the world's fastest Mini. The pictures are from a show at Bingley Hall and were kindly supplied by Simon Llewellyn. 1 Modified sub-frame to take Vauxhall engine & F20 Box. The kit is priced at £750 and is race proven. The customer must provide a donor sub-frame & engine mount rubbers. Phone (01902) 765466 - 0976 985429 for more details. 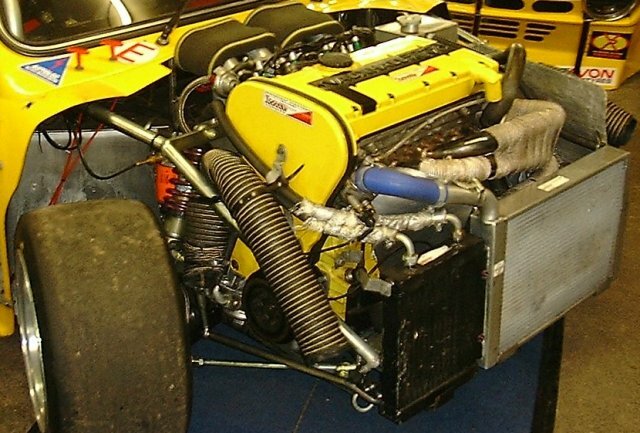 Huge radiator and oil cooler necessary for a 2 litre, 286 BHP engine and 10"wide tyres to get the power down! 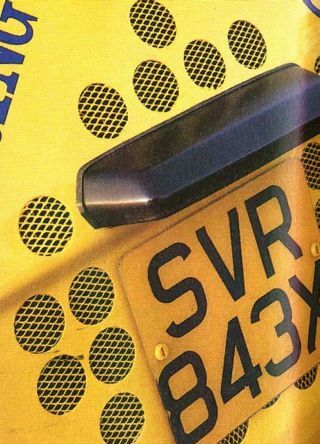 This article appeared in Mini-World November 1996. Like many of us, Nathan Dobson began his driving career in a standard 1000cc Mini (reg GLK 114T). He learned the basic driving skills, passed his test and then used the vehicle as his regular daily driver. However, as he was, at the time, an apprentice mechanic - he is now a fully trained Rover technician - it wasn't long before he developed a thirst for more power. But, unlike most of his peers, he didn't want to splash out on a GTi or XR3 in order to fulfill his heart's desire. Instead, Nathan decided to endow his standard Mini with the power equivalent of those faster and more expensive cars. Nathan's first foray into tuning involved fitting twin SUs and a loud exhaust system. Unsurprisingly, this didn't satisfy him for long and soon he took the next steps towards acquiring more grunt. 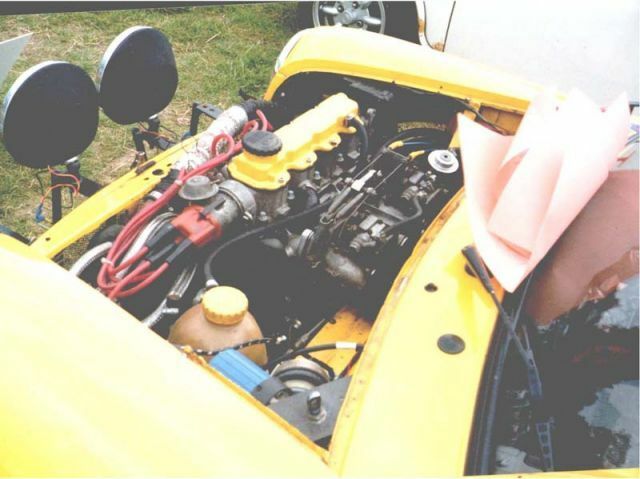 Consequently, a Mini Sport 1293cc short motor was located and then he fitted a 544 cam, modified his own cylinder head and dropped it all on to an Allegro box. The end result was a cheap, but effective jump in horsepower. Before too long, the fourth spec was launched on the unsuspecting residents of New Malden, in Surrey. By now, it was pretty much the ultimate A-series stuff: the short motor wore a 649 camshaft, a stage 4 cylinder head, belt drive systems for camshaft and auxiliaries, a steel flywheel, a straight-cut three-synchro gearbox and straight-cut drops. Realistically, little else could be done, but he hankered after more! Nathan's father introduced him to Mark D'Souza and, between the pair of them, a definitive master power plan was devised - there would be no need for further mods after this! The plan was big: the A-series would be replaced with a Vauxhall motor, but a 1300cc or 1600cc version didn't feature in their designs. No, it was the two-litre, 16 valve lump that formed the basis of the 1995 British Touring Car Championship winning Cavalier or nothing! During the winter of 1995, work began in earnest. To the consternation of some of his friends and colleagues, the Mini was pulled to bits, and the 1300cc motor was sold. The funds that he raised from the sale enabled him to buy a very good low-mileage Vauxhall lump, with plenty of change left over. Finding the gearbox was simple: a £60 Mk1 Astra model from a breakers yard. So, total spend so far was £760, with £240 left in hand. In its standard form the Vauxhall engine produces 150 BHP, but Nathan decided that modifications were necessary. 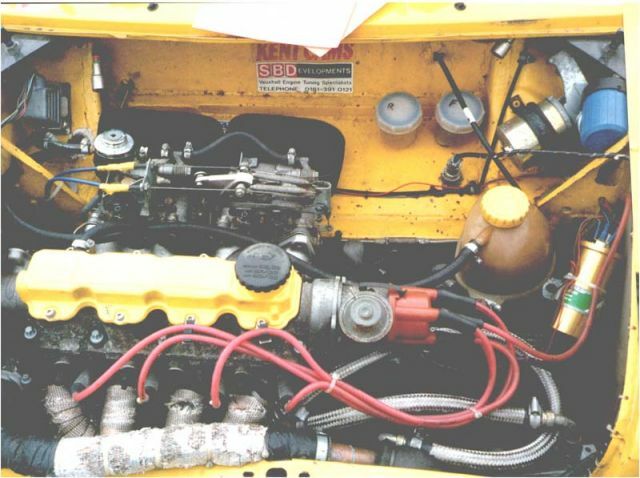 The fuel injection system was removed and was replaced by twin Weber 45 DCOEs. This raised the power to 180 BHP and simplified the installation too. Now it was time to make the engine fit. Nathan and Mark put the Mini to one side and obtained a donor front sub-frame and the front section of a scrap shell. The plan was to install the engine in the sub-frame and repeatedly lower the front bodywork over the top to check for clearances and any necessary bodywork shaping. This meant any mistakes could be corrected before starting work on the real thing. from that of Minis in general. Despite having the engine so far back, everything was still tight at the front when they lowered on the body section. 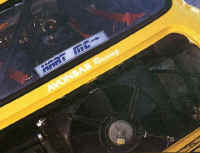 With the gearbox on the end of, as opposed to underneath, the engine, the cam sprockets and drive belts were located partly under the front offside wing. In addition, the alternator was fixed extremely tightly against the front panel, as were the centre two branches of the exhaust manifold. As there was very little space here for the radiator, it was decided that this should be relocated to the boot. All in all, Nathan and Mark were concerned about the practicalities of such a tight installation and worked on an alternative scheme. The front wing had to be lengthened by two inches and raised by three-quarters of an inch. This was done to ease the clearances and enable a front radiator to be installed; by raising the wings and front panel, the bulge caused by the timing belt end of the engine could be reduced drastically too. Now the engine mounts could be made: they used Cortina front and Fiesta rear rubbers and fabricated sub-frame mountings were produced. However, the drive-shafts proved to be a problem as GM patterns were required at one end and Rover at the other. It is possible to have these items individually made but the expense involved dissuaded them from that idea. Instead, Jim Weston, a former wartime engineer and Nathan's neighbour, stepped in to help. After calculating the necessary length, both shafts were cut, turned to a point and arc-welded together. Then it was smoothed and straightened. Now it was time for the next big step and, fortunately, after such thorough preparation the cutting went smoothly. The front bodywork modifications and a full repaint were undertaken by Paul of KRD Coachworks, and the clean and distinctive results speak for themselves. Jim Weston made up some solid front sub-frame top mounts and pre-1976 front sub-frame rear legs were used to keep things steady. An air box was let into the front bulkhead to accommodate the 45s, and, by machining an angle onto the face of the inlet manifold, the carbs were inclined sufficiently to allow proper air filters to be attached. Finally after nine months, the work was complete and the car was a runner again - and it was impressive. So I was invited to try the Mini in its urban environment on the Surrey streets. Initially, Nathan drove and I nervously attached the full harness belts and settled into the Corbeau bucket seat. Moving off in second gear, the car sounded nothing like a Mini: the induction noise was all Weber, but the drive was smooth. On to the open road, and in a burst of second and third gears at full throttle, we were literally hurled up the street. I was petrified! In the driver's seat, a sense of calm returned. The interior trim is sparse as the car is intended to be used for drag racing too. Moving off in first gear, it was obvious why Nathan always chooses second. With the Mini only having 10" wheels and such immense torque, second is only really first and a bit, so it's the best gear to use. The car drives well at moderate speed; its 180 BHP has been developed in such a way that the idle and low revs performance is super smooth, as you would expect of a modern road monster. The brakes are adequate, and the handling and ride is that of the standard car, but a simple quirt of the throttle propelled us to another planet. There was no delay or lag, just instant propulsion. For a road car, the grunt is beyond comparison, but the brakes simply don't measure up; this must be the next area for modification. For this job, vented Metro Turbo discs with Metro iron four-pot calipers can be made to fit beneath a 10" wheel and sourced from a breakers yard. By the same token, the handling cannot be expected to cope with this sort of power. If pushed hard, the Mini will become an over-steering monster. So more precise control of the front suspension is needed; rose-joints are the best choice, but even up-rated bushes would give some improvement. However, Nathan has already taken account of this: on the list behind brakes, suspension and the set up generally, is the exhaust system, a beam axle for the rear and an LSD to deal with traction. The exhaust down pipe has to pass under the sump as it gets damaged by even modest bumps. Nathan intends to solve this by removing the sump, and creating a passage for the pipe between the sump and clutch housing. The beam axle is intended to reduce the weight further, and the diff is aimed at performance on the drag strip. When the Mini was in its A-series spec, it recorded 16.2 seconds for the standing quarter-mile with a terminal speed of 82 mph. Now complete with its Vauxhall engine motivated and 13" slick shod that has been reduced to 14.6 seconds at 26 mph. These are credit-worthy figures and, with suspension and brakes to match, this Mini will be able to compete with anything it meets on the road. Look very closely at the front of Nathan Dobson's Mini - a slightly raised blimp in the Cooper bonnet stripe indicates something a little out of the ordinary. 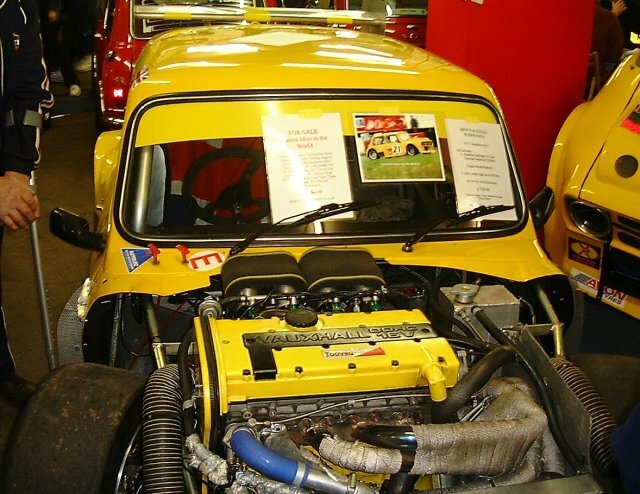 The Vauxhall 2 litre lump in a round-nose Mini! Sparse interior for drag-strip work. This Mini is based on the single overhead cam variant of the Vauxhall engine. While not as powerful as the 16v version it still provides easily enough power for a Mini. Out of all the articles featured on this site, this is the only one that actually features a power/torque curve. Take a look, I reckon you'll be surprised! Some important notes about the car: it's been fitted using a standard size round (non-Clubman) glass-fibre front. Normally, such an engine would require a lengthened front or at least a Clubman shaped front. However, the reason this car achieves the seemingly impossible is because its radiator is mounted in the boot area of the car, as shown in the pictures. Note the fan mounted over the radiator, ducting air from the wire-mesh covered holes in the boot skin. The SOHC variant makes for a compact installation with lots of room in the engine bay. Set ride height to obtain slight nose down attitude say 0.5 inches. Reduce rear negative to 0.5 degrees. Fit an auxiliary bearing onto the right-hand drive shaft to achieve equal length articulation. Fit harder, say 160LB/inch springs on the rear and 360LB/inch on the front. Fit front anti-roll bar of about 16mm diameter. Reduce the scrub radius of the front wheels to reduce torque-steer effects. Optimise corner weights after redistributing some of the components indicated above.